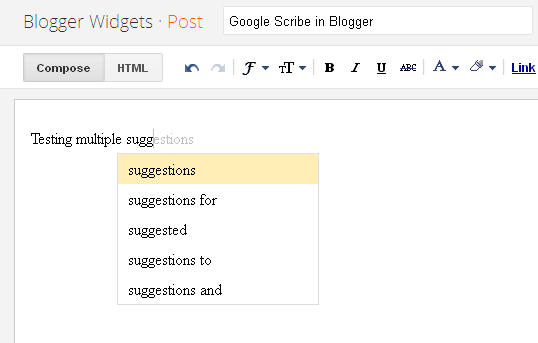 Google Scribe is an Auto text completion tool which was launched in Google Labs an year ago. Google has recently added this feature to the Post Editor in its Draft version. Google Scribe helps you write more efficiently by auto completing words and phrases as you type. Google Scribe supports Arabic, Dutch, English, French, German, Hungarian, Italian, Polish, Portuguese, Russian, Spanish and Swedish and the language is automatically detected using the text in the post. 2. In your post editor, you should see a pencil icon on the right(available only in the Compose mode). clicking this icon will enable/disable Scribe. Once Google Scribe is turned on, suggestions will appear in grey as you type.You can accept the suggestion by hitting the space bar or by keying in a punctuation mark. 3. If you would like to get more than one test suggestion at a time, then click on drop menu next to the Pencil icon, and Select "Show multiple Suggestions"
...and here is a screen shot of the multiple suggestion in action. TAB - to restore a suggestion. Try scribing, and do let me know how it goes :)..
Thats a good feature that they have introduced. At times in doubt, I always refer to these suggestions. Blogger developed more and more every day, it's a good idea for a non-native speakers. I can't believe I never heard of Google Scribe, Thanks! "org.apache.shindig.common.xml.XmlException: The element type "meta" must be terminated by the matching end-tag "". At: (1,54)"